The real lesson of late Quaternary mass extinctions is not that strange things happened in the past, a superficial impression that is the only one this ongoing debate will leave with the general public. Instead, Quaternary paleoecologists should unite to publicize one of the greatest discoveries in the history of paleontology: Long before the dawn of written history, human impacts were responsible for a fantastically destructive wave of extinctions around the globe. This message should be seen as a wake-up call instead of a mere omen of disaster. Many forces that could trigger extinction are evident in Earth’s history. Proposed explanations for the near-time extinctions have included meteor strikes, climate change, nutrient shortages, and disease, among many others. But for half a century, the explanation that has made the most sense to me is what Richard Klein (1999, 564) calls the “ecological shock of human arrival.” Climatic change is always of interest but not crucial in formulating explanations. As our species spread to various continents, we wiped out their large mammals; as we progressed to oceanic islands, we extinguished many mammals that were much smaller, and even more birds, especially flightless species. Based on the concept that animal populations could have sustained some additional predation, but not as much as took place after human arrival, this explanation has come to be known as “overkill.” Some zoologists, such as Ross MacPhee, agree with an anthropogenic explanation (one linked to human activity) but attribute the extinctions to “overill,” the introduction by humans of predators, competitors, or disease vectors such as Pacific rats (Rattus exulens). In any event, some aspect or aspects of human activity appear to have been the ultimate cause of these historic extinctions (Flannery and Schouten 2001). The idea of overkill was not unknown when I began studying extinctions of near time. Yale’s famous Quaternary geologist Richard Foster Flint brought up the possibility of human involvement in late-Quater-nary extinctions (Flint 1971). Ed Deevey (and long before him, Darwin’s contemporary, Sir Richard Owen) had suggested something similar in the case of New Zealand’s moas. And by the 1950s, work by vertebrate paleontologist Claude Hibbard and by paleontologists in South America indicated that the large mammals of the Americas disappeared at a time when our species or its ancestors were present. Nevertheless, Hib-bard and many other vertebrate paleontologists favored climatic change as the ultimate explanation for prehistoric extinction of terrestrial vertebrates in the Americas. To test the hypothesis of human involvement, it would be vital to establish relatively exact dates for both the extinctions and the arrival of humans at the places the extinctions occurred. The geographic and chronological patterns of the extinctions should help reveal their cause. Identifying these patterns, however, posed a challenge. Our knowledge of extinct faunas had long been dependent on stratigraphy (study of the composition and order of the strata of the Earth’s crust), chronology (age of the extinctions), and paleontology (the study of fossils). None of these allowed for dating on the scale required for our purposes. The breakthrough came with radiocarbon dating and the possibility of recovering age estimates of late-Quaternary extinctions accurate to within a century or less. Willard Libby’s new method of radiocarbon dating promised to allow human and nonhuman fossils from within roughly the last 50,000 years to be dated with precision, yielding age estimates in the last 20,000 years (dates with errors of at most a few hundred years). By establishing dates for the known fossils of any given species, we could make educated guesses about when that species went extinct and whether the extinction was sudden or gradual. For example, it was now possible to demonstrate that Wrangel Island, in the Arctic Ocean north of Siberia, sustained a population of woolly mammoths thousands of years after the species had gone extinct in the rest of its range. Radiocarbon dates tell us that woolly mammoths endured on Wrangel into the time of the pharaohs, roughly 4,000 years ago (Vartanyan, Garutt, and Sher 1992). In comparison, the extinction date for mammoths in western North America is now set at around 11,000 radiocarbon or 13,000 calendar years ago. In the early days of less reliable radiocarbon measurement, the extinction of mammoths and other large mammals was mistakenly thought to be more recent. Now we know it was, not only on Wrangel but also on St. Paul in the Pribilofs in the Bering Sea (Guthrie 2004). By the same token, dates on dwarf mammoths on San Miguel, off the California coast, agree in age with those from the mainland. These details suggest that Wrangel and the Pribilofs were temporary refugia, bypassed by the first Americans. Thanks to radiocarbon and other geological methods of dating, we now know the timing and pattern of many extinctions in considerable detail. Globally, the chronological progression is extremely interesting. The sweep of extinctions of large mammals began gradually and inconspicuously in Africa over two million years ago, intensified in Europe beginning with the extinction of the Neanderthals 50,000 years ago, hit hard in Australia 40,000 to 50,000 years ago, and exploded in the Americas around 13,000 years ago. Apart from the Tertiary genus Imagocnus of Cuba, all extinctions of dwarf ground sloths in the Greater Antilles that can be dated are considered to be postglacial, postdating the extinctions of their relatives, the megalonychid ground sloths of the embracing American continent. Dwarf ground sloth extinctions in the Greater Antilles began around 5,000 years ago. In the last 3,000 years, extinctions swept thousands of taxa of flightless birds and many land snails from the islands of the remote Pacific, beginning in the west in Tonga, New Caledonia, and Fiji (those islands closer to the Asian mainland) and ending 1,500 years ago (or later, in some cases) in Hawaii, the Marquesas, and Rapanui (Easter Island). Extinctions struck Madagascar beginning less than 3,000 years ago. The extinction of moas in New Zealand took place only 500 years ago. These extinctions reflect the spread of our species. There are far fewer deep-water islands in the remote Atlantic than in the remote Pacific, and very likely for that reason prehistoric voyagers did not manage to find and colonize the Azores, Ascension, Bermuda, Fernando de Noronha, and St. Helena. Extinctions in radiocarbon time generally occurred later on the remote Atlantic islands than on the deepwater islands in the remote Pacific, which had been discovered and in many cases settled prehistorically, beginning 3,000 years ago. Historic extinctions include at least 200 species of vertebrates (Flannery and Schouten 2001), ranging in size from Steller’s sea cow (10,000 kilograms, or 22,000 pounds) on islands in the Bering Strait to Lyall’s Wren (flightless and mouse-sized) on Stephen’s Island in New Zealand. Even before the loss of the moa, the introduction of Pacific rats apparently eliminated many ground-nesting birds and giant insects in New Zealand (Worthy and Holdaway 2002). Endemic species on oceanic islands remain at risk, as the recent fate of flightless rails and other birds subjected to predatory attack by introduced continental brown tree snakes (Boiga irregularis) indicates on the island of Guam (Wiles and others 2003). These tail-end, historic extinctions have been a replay of the big event in miniature (Flannery and Schouten 2001; Quammen 1996). They are far outnumbered by earlier near-time extinctions, which, overall, eliminated large land vertebrates to a degree not seen since the end of the dinosaurs. To me the core piece of evidence for human involvement is that when viewed globally, near-time extinctions took place episodically, in a pattern not correlating with climatic change or any known factor other than the spread of our species. Extinctions followed prehistoric human colonizations in a “deadly syncopation,” to use the words of mammalogist Ross MacPhee. As explained further in “Radiocarbon Dating and Quaternary Extinctions” (p. 44), there is radiocarbon and other geochemical evidence that the earliest human arrivals on various landmasses were contemporaneous with the last days of the extinct species. Simply stated, as humans moved into different parts of the planet, many long-established huntable animals died out. The archaeological record indicates that the earliest humans in America were the Clovis people (so named after their distinctive spear points, first found near the town of Clovis in eastern New Mexico). Around the time Clovis points and other prehistoric artifacts first appeared, two-thirds of the large animals of North America north of Mexico suffered explosive extinction. Mexico, Central, and South America lost even more, including commensals and parasites that disappeared with their hosts. Extinctions in other parts of the planet, too, are suspiciously close to the time of first human arrival. The scenario is familiar to us in the case of historic extinctions. We can document that many of these were caused by over-hunting, habitat destruction, or the introduction of other aliens. Nevertheless, many archaeologists are rooting for a pre-Clovis entry of humankind. In addition, some prefer to attribute the megafaunal extinctions to climate change. At times the dispute resembles the partisan passion of a hard-fought political campaign. Some archaeologists are baffled that humans can be held responsible for extinctions of large mammals, such as ground sloths and glyptodonts, only 13,000 years ago, with no evidence of even a single kill site. The problem is that the fossil record rarely discloses the cause of mortality, much less of extinction. In near time, Africa and Asia suffered least. This does not mean that hominids would have had little to do with shaping the African and Asian faunas. However, interactions between evolving hominids and African wildlife, for instance, extend over at least two million years. The resulting coevolution would have meant that as human hunting skills advanced, so did the wariness and defenses of potential prey. Similarly, in Eurasia, the contact between horses and camels and Paleolithic people was gradual and thereby more favorable for both survival and domestication of the large herbivores than the sudden sweeping contact that took place when humans entered North America. The evidence regarding the mammals’ final demise is quite different from that regarding the dinosaurs’. As every first-grader knows, dinosaurs vanished 65 million years ago, smashed to pieces by a space rock. Not all geologists will agree, but I am impressed with the evidence that dinosaur extinction may have involved an asteroid or large meteor striking our planet (L. Alvarez and others 1980; W. Alvarez 1997; Powell 1998), an extraterrestrial accident that has been compared with the detonation of a 50-ton atomic bomb. Whatever happened also wiped out innumerable other terrestrial and marine species, some of them small in size, along with many vascular plants. In near time, however, there is no hint of such a catastrophe. A meteor crater in northern Arizona is about 50,000 years old, too old and much too small to account for extinctions of mammoths and ground sloths. There is no evidence of elements that are common extraterrestrially but less so on Earth, such as iridium, and no sign of a tsunami or other phenomena following the impact. Moreover, the near-time extinctions were highly selective, sparing aquatic species and plants. Finally, their unfolding over tens of thousands of years precludes a one-shot global catastrophe. Indeed, perhaps the one thing most specialists can agree upon is that the near-time extinctions had nothing to do with a space rock. In a sense, the absence of such an explanation is unfortunate, as one would find a highly receptive audience among astronomers and their public had mammoth extinction shared similarities with dinosaur extinction. As noted, climate change is frequently invoked to explain the near-time extinction spike. Geological evidence and shifting percentages of fossil pollen indicate that the late Quaternary was indeed a time of severe and rapid climate change. So, however, were earlier stages of the Quaternary. Why, then, is there not a trail of extinctions of large mammals through the last two million years as the ice advanced and retreated, sea levels rose and fell, and plant communities moved farther north and farther south, higher and lower in elevation? If glacial climates forced the large animal extinctions, they should have struck when the susceptible animals encountered unfavorable climatic change going into the Quaternary. This is what paleontologist O. P. Hay claimed early in the twentieth century, before it could be shown that supposedly “early” Quaternary faunas were actually misdated (Martin 1967b). They were much younger. Extinctions of large Quaternary mammals in North America did not concentrate toward the beginning of the Quaternary ice age, or throughout the 1.8 million years involved, but piled up toward the end, within near time. Whatever was involved in forcing extinctions had to be something late in the Quaternary, not early or throughout the ice age. The possibility arose that the entire concept of climatic change as a driving force in prehistoric extinctions might be bankrupt. That would not go over with many vertebrate paleontologists, including one of my former dissertation committee members at the University of Michigan, Claude Hibbard. Known to his friends as “Hibby,” he prepared a surprise for me when I gave my first extinction talk to the Museum and Department of Zoology at the University of Michigan soon after earning my Ph.D. Hibby believed that the fossil giant tortoises of Kansas, where he excavated spring deposits, could not have survived freezing temperatures in winter because their living representatives, Galapagos tortoises, died when exposed to cold weather. After I finished my review of the large animal extinctions, having showed how on a world scale they corresponded with human arrivals, and called for the lights, Hibby whispered to the projectionist to hold the lights while he slipped in a slide of his own. Up on the screen went a cartoon of a glacial winter in Kansas, complete with a giant tortoise decked out in a scarf, earmuffs, down jacket, and snowshoes. The audience roared. Hibby won that round. Nevertheless, we cannot be certain that giant tortoises in North America did not have the physiological capacity to survive the coldest winters deep underground, like early homesteaders in the west who dug their cellars first so they could winter there. The near-time extinction spike in the late Quaternary must have been caused by something outside the normal experience of mammals, and climatic change is as good a place to start the analysis as any. But the temperate animals that suffered extinctions had long been exposed to continental climates and presumably must have been accustomed to many changes. 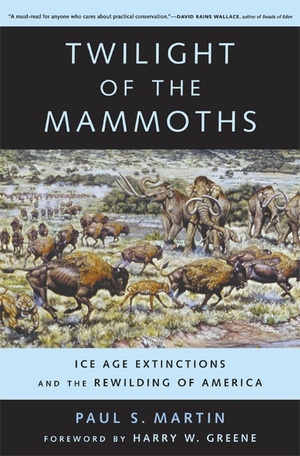 According to John Alroy (1999), there had been no more severe loss of large species since the evolution of large mammals tens of millions of years earlier. The arguments for and against climate change as the cause of the extinctions are discussed more fully in chapter 9. The cause of prehistoric extinctions has been a topic of hot debate since the mid-1960s, debate that I helped ignite by linking the extinctions to the first appearance of humans—Clovis hunters, or First Americans—in the New World (Martin 1958a, 1967b). Some anthropologists find merit in the overkill theory, others discount or reject it because fossil evidence for human hunting in the crucial time frames is sparse at best. Some argue that even if human predation were involved, climatic change must be as well (Krech 1999). Moreover, the proposal that near-time extinctions in some critical way involve people, our species, Homo sapiens, requires at least a modicum of cultural sensitivity. Certainly no one can pass judgment, from long after the fact, on the peoples who first discovered and inhabited new lands. Their achievements were truly remarkable. It is one thing to note synchronicity in the arrival of first pioneering prehistoric people in various corners of the planet and the concurrent extinction of many native animals; it is another to make a judgment. It would be absurd to assign blame to the progeny of Paleolithic Europeans or of the First Americans for the extinction of the Old World or New World mammoths, to Australian Aborigines for the end of the diprotodonts, or to the New Zealand Maoris for eliminating the moa. It is important to remember that the extinctions of near time occurred worldwide. To the extent that responsibility is assigned, it belongs to our species as a whole. This may be an even more disturbing thought for many. Geologists travel into “deep time,” which envelops a fossil record of hundreds of millions of years of organic evolution, including five mass extinctions. The rest of us may regard events of 13,000 years ago (the time since the American megafauna disappeared) as decidedly ancient. After all, a life span of one century is beyond the reach of all but a very few of us. Who can comprehend 130 centuries, over 10 times the age of Methuselah? In a sense we are like fruit flies, which live but a few weeks and cannot experience most seasonal changes, much less a year. We cannot know from experience the history of planet Earth. Most of it is destined to be as abstract to a layperson as the dimensions of the universe. Why, then, is it important to understand what happened to the large mammals thousands of years ago? Why should we care that they are no more, and that our species might be the reason for this? Since they are extinct and thus absent from our zoos, who really misses the giant short-faced bears? Or the giant ground sloths? And why should even those particularly interested in the survival of species look to a distant, irretrievable past when the present and the future offer so many immediate concerns? Such reductionism shuts off vital insights and golden opportunities. Extinctions in near time look suspiciously like the overture to the accelerating extinctions of recent years. For several reasons, extinctions in near time cast a very dark shadow on ecological systems worldwide and on efforts to protect those systems. First, if we do not look back to the late Quaternary, we underestimate the rate of extinction during the presence of humans on the planet. This is no problem for normal or background extinctions, which sputter along like the decay of isotopes. Theoretically, background extinction is roughly in balance with the evolution of new taxa. But extinctions in near time far exceed background extinctions. Ignoring, for example, the disappearance around 13,000 years ago of the horses, mammoths, and mastodons that had been native to North America for tens of millions of years seriously affects any estimate of the rate of environmental degradation during our tenure on the planet. What would it mean to someone measuring the rate of theft from a department store if many of the large and expensive items—the overstuffed couches, recliners, dining room tables, and giant-screen TV sets—had been ripped off shortly before the inventory began? Surely this pilferage would have to be taken into account. Second, the loss of these mammals before historic time crippled our reaction to recent extinctions and threats of extinction. The absence of mammoths, ground sloths, and others derailed a much more intense involvement with American wildlife than could be developed with the blighted survivors of near-time extinctions. Most of us are more susceptible to large, warm-blooded, furry, bright-eyed mammals than to reptiles, amphibians, insects, birds, or tiny mammals such as shrews. Perhaps it is because the large mammals seem to be the most like us. It is no coincidence that so many conservation organizations choose such animals as the symbols for their campaigns. Lewis and Clark should have found “great claw,” just as Jefferson hoped. It is entirely possible that even if the amazing late-Pleistocene megafauna had survived on our continent to the time of European arrival, we would have succumbed to the nineteenth-century delusion of limitless wilderness and hunted most of them down, the way we did bison in the 1880s. However, had even a few of the gentle giant ground sloths and their coevals survived to the twentieth century, a campaign to save them would surely have had more mass appeal than the campaigns to save the snail darter and the Delta smelt, ecologically important though these small fish are. The very existence of the great mammals might have helped us come to our senses. Impulses for conservation and preservation could have been awakened far earlier and more powerfully, and I believe we would be far ahead of our current efforts to attain global sustainability, heroic as they are. A crucial corollary is that greater awareness now of these long-extinct mammals may still energize conservation efforts. Knowing that we have lost far more than we had ever imagined makes it even more vital to preserve what we have left. Third, ignorance of the late-Pleistocene extinctions warps our view of what “state of nature” we should be trying to conserve or restore. In North America, the modern extinction-pruned large-mammal fauna, those animals at “home on the range” since European settlement, are not a normal evolutionary assemblage. The fossil record thus suggests, for instance, that we reconsider the impact of wild equids in the New World. Because horses evolved here, flourished for tens of millions of years, and vanished around 13,000 years ago, their arrival with the Spanish in the 1500s was a restoration, not an alien invasion. In evaluating the ecological impacts of wild horses and burros, we need to be aware not just of their presence in the last half millennium, but of the coevolution of equids with the land for tens of millions of years before a relatively brief 10,000-year interruption. More broadly, the life and times of the mammoths and other megafauna need to be understood before we can claim to know the true nature and potential of our planet. If Henry David Thoreau was not thinking of mastodons and giant ground sloths when he wrote, “I wish to know an entire heaven and an entire earth,” he might as well have been. The last “entire earth” known to humans disappeared with the mammoths around 13,000 years ago. Thoreau wrote in his journal (March 23, 1856): “I cannot but feel as if I lived in a tamed and, as it were, emasculated country....I should not like to think that some demigod had come before me and picked out some of the best of the stars.” Demigods (the first European settlers) had driven cougar, lynx, wolf, moose, and deer from the woods of Concord. And earlier demigods, the First Americans, may have destroyed the mastodons and other large Pleistocene mammals. If so, Thoreau’s words reached deeper than he knew. Because of our ignorance of, or indifference to, prehistoric extinctions, we lack understanding of the natural riches of this planet, and that lack has narrowed our vision of how to plan for the future, especially in America. After 40 years of investigating the late Quaternary, I am dismayed that the fate of the Quaternary megafauna and its meaning for the deep history of our country, our continent, and our planet have yet to capture the public’s interest. Most people visiting our great museums breeze by the mammalian megafauna to ask after the dinosaurs, even bigger and vastly more popular icons. We know that the extinction of the dinosaurs was an awesome event. My purpose in writing this book is to encourage similar awareness of the extinction of the great mammals. The following chapters outline the evidence, as I see it, for the overkill theory. Some of this evidence comes from my own expeditions into near time, and more of it from the discoveries of former students and colleagues. We shared adventures as we investigated the extraordinary animals that once lived on the planet and how they fared when people began to spread out of Africa and Eurasia. For me, these adventures began at the Desert Laboratory of the University of Arizona—a unique source of new data and a sanctuary against too much exposure for those of us testing radically new ideas about the wild. As recently as 11,000 years ago—"near time" to geologists—mammoths, mastodons, gomphotheres, ground sloths, giant armadillos, native camels and horses, the dire wolf, and many other large mammals roamed North America. In what has become one of science's greatest riddles, these large animals vanished in North and South America around the time humans arrived at the end of the last great ice age. 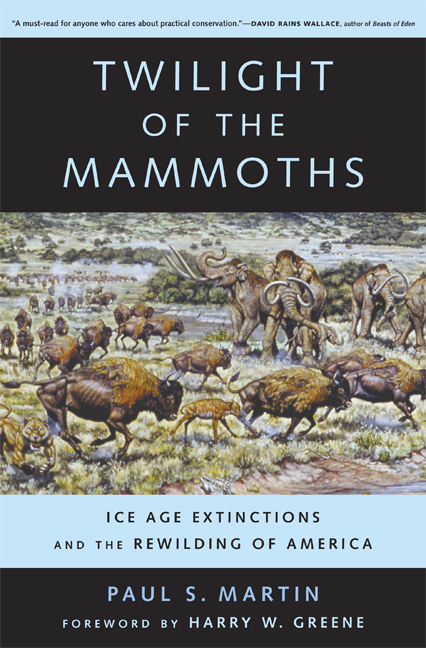 Part paleontological adventure and part memoir, Twilight of the Mammoths presents in detail internationally renowned paleoecologist Paul Martin's widely discussed and debated "overkill" hypothesis to explain these mysterious megafauna extinctions. Taking us from Rampart Cave in the Grand Canyon, where he finds himself "chest deep in sloth dung," to other important fossil sites in Arizona and Chile, Martin's engaging book, written for a wide audience, uncovers our rich evolutionary legacy and shows why he has come to believe that the earliest Americans literally hunted these animals to death. As he discusses the discoveries that brought him to this hypothesis, Martin relates many colorful stories and gives a rich overview of the field of paleontology as well as his own fascinating career. He explores the ramifications of the overkill hypothesis for similar extinctions worldwide and examines other explanations for the extinctions, including climate change. Martin's visionary thinking about our missing megafauna offers inspiration and a challenge for today's conservation efforts as he speculates on what we might do to remedy this situation—both in our thinking about what is "natural" and in the natural world itself. Paul S. Martin is Emeritus Professor of Geosciences, Desert Laboratory, University of Arizona.